The next attempt by ms to compete in mobiles. Microsoft just announced the long awaited successors to its Surface RT and Surface Pro devices at a press event in NYC. We were fans of the original Surface devices, however neither was quite perfect. It'll be a short while before we can actually review these things (they ship on October 22nd), but on paper we can already get a good indication of what Microsoft has done to both lines. Surface RT is succeeded (not replaced) by Surface 2. The previous generation Surface RT model will remain on sale for $349, putting it at a very compelling price point in the 10-inch tablet market - especially considering that it comes with a full version of Office. The new Surface 2 takes its place at $449 and features a long list of upgrades. The display is now full 1080p with improved color accuracy compared to the outgoing model. Microsoft spent a lot of time last year talking about how it's 1366 x 768 panel was better than most thanks to its optically bonded display, but it's good to see a shift towards a higher resolution panel. The focus on improving color accuracy is important as well. In our original review of Surface RT I found its display to be ok, but hardly accurate. Given that both Apple and Google are now shipping relatively well calibrated tablet displays, it's key that Microsoft does the same. The only downside is it looks like the new display isn't full sRGB but rather a smaller gamut. Internally Tegra 3 is out and replaced by Tegra 4. Just like last time, Tegra 4's 5th shadow core isn't exposed or used under Windows RT 8.1. I know I was personally expecting a Snapdragon 800 based device, but those initial rumors also pointed to the Qualcomm based Surface tablet being smaller than 10.6-inches as well so it's entirely possible that we'll see Qualcomm show up at a later point. The move to Tegra 4 comes with four ARM Cortex A15 cores and a much better GPU. The combination of the two should deliver a much better experience on Surface 2 than with Surface RT. The latter was simply too slow, but I'm expecting big things from the Tegra 4 upgrade. Although I completely understand why Microsoft is interested in going with an ARM partner for Surface 2, I do wonder if it might've been a better idea from a power efficiency standpoint to use Intel's Bay Trail instead. Note that with Surface 2 Microsoft drops the RT from the device's name. We'll see what happens with Cherry Trail next year. Dimensions 10.81 x 6.79 x 0.35" 10.81 x 6.77 x 0.37" 9.50 x 7.31 x 0.37"
Surface 2 retains the full sized USB port and microSD card slots on the device itself, although the former gets upgraded to USB 3.0. Internal storage options remain at 32GB or 64GB eMMC. Both front and rear facing cameras are improved over the original design as well. The design of Surface 2 improves over its predecessor. Surface 2 is slightly thinner than its predecessor and is a little lighter as well. The device now features a silver colored VaporMg finish and a 2-stage kickstand. Although I loved the idea of the kickstand with the original Surface devices, I felt that it was often not at the right angle for me to use on anything other than a table. Surface 2's 2-stage kickstand should allow for some flexibility, although I'm curious to see how this works in practice and if there are any sacrifices to the overall stability of the stand. 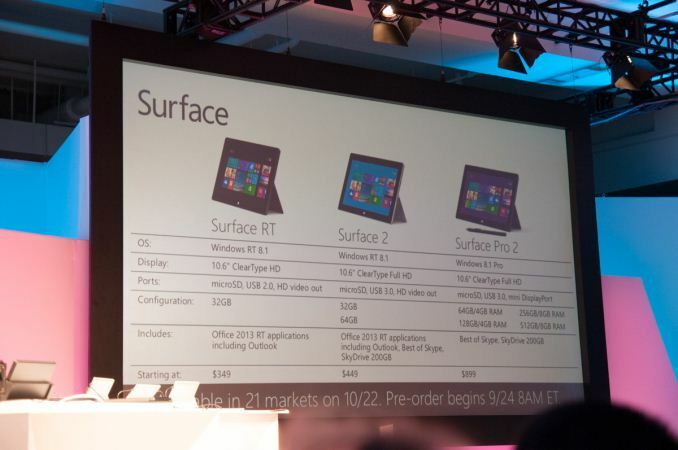 Surface 2 will ship with Office 2013 RT including Outlook RT and come with 200GB of free Sky Drive storage for 2 years. The entire package starts at $449, but once again does not include a touch or type cover. 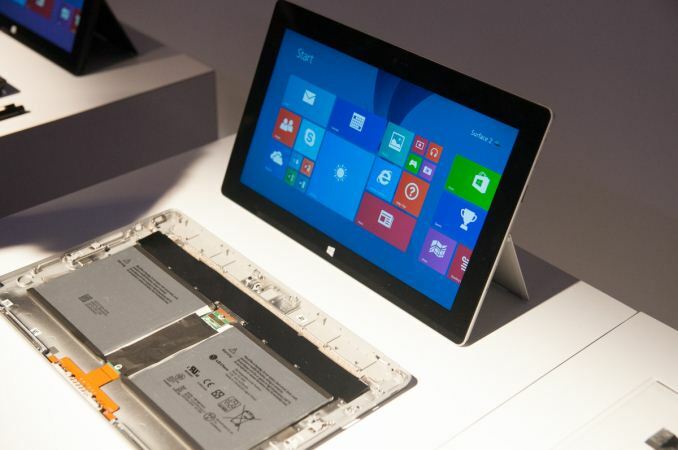 The 64GB Surface 2 will sell for $100 more at $549. 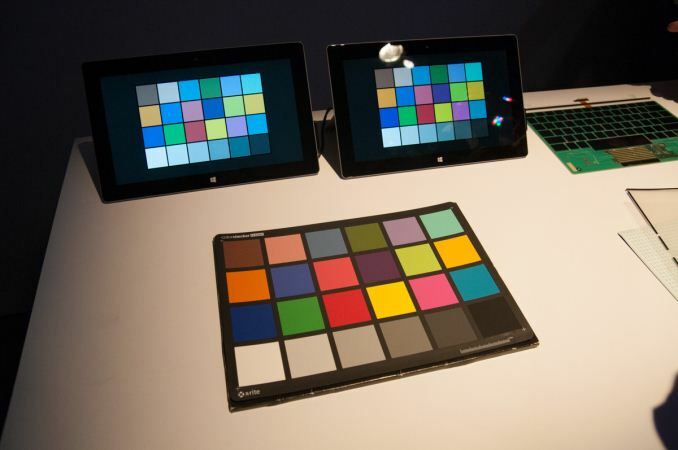 Surface Pro 2 sees a similar set of upgrades. It gets an updated display (the original Surface Pro was already 1080p) with better color accuracy. USB 3.0 support existed on the previous model as well. The big upgrade here is to a Haswell based Core i5-4200U. That's a 15W Haswell part (similar to what you'd find in an Ultrabook) but with Intel's HD 4400 graphics and not HD 5000. The move to 15W Haswell means there's no real reduction in device thickness with Surface Pro 2. This continues to be an interesting design decision on Microsoft's part. While I'd personally advocate for a lower wattage Y-series SKU, it could be that Microsoft feels the added performance of a full Ultrabook Haswell ULT SKU is necessary for Surface Pro's target market. Either way the move to Haswell should come with significant improvements in battery life (Microsoft claims a 75% improvement for Surface Pro 2, and 25% for Surface 2). Dimensions 10.81 x 6.81 x 0.53" 10.81 x 6.81 x 0.53" 9.50 x 7.31 x 0.37"
Surface Pro 2 starts at $899 and now comes in four different configurations You can get Surface Pro 2 with a 64GB ($899) or 128GB SSD ($999) and 4GB of RAM, or if you want 8GB of RAM there are 256GB ($1299) and 512GB ($1799) versions as well. Surface Pro 2 retains the old front and rear cameras. 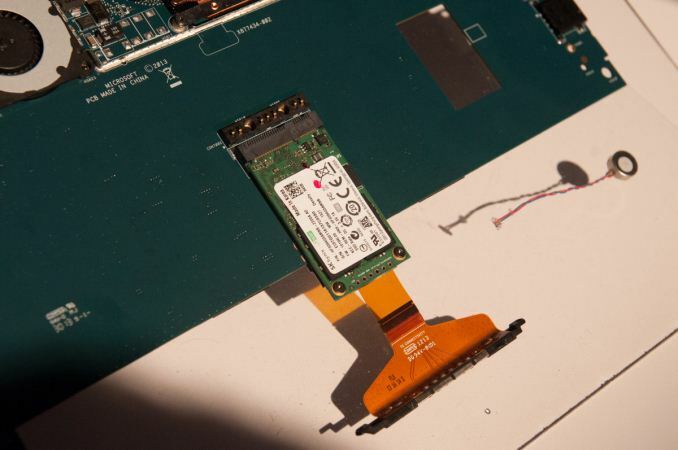 As you can see in the gallery below, the PCB for Surface Pro 2 is absolutely huge. I'm really curious to see why Microsoft went this route vs. trying to fill the device's volume with a battery like most of the other tablet makers. I know in the past Microsoft was very big on weight distribution vs. lower overall weight, but I do wonder if a lighter Surface Pro 2 might've made sense here. 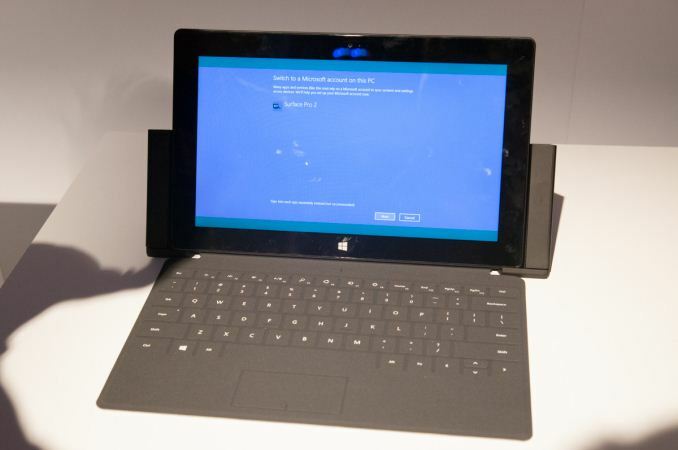 A big part of the Surface story is of course the detachable keyboard covers. This generation both type and touch covers see upgrades. They are both thinner and lighter, and both are now backlit as well. The new touch cover features 1092 sensors (up from only 80 in touch cover 1), which should improve response and accuracy. If you remember back to our original Surface reviews, touch cover accuracy was one of my biggest complaints. It was better than typing on a screen, but not as good as a real keyboard. I'm wondering if the new design helps here at all. The type cover sees a 1mm reduction in key travel, which helps reduce thickness of the cover itself (although potentially at the expense of typing feel). You can also now get the type cover in four different colors as well (purple, pink, blue and black), instead of just black like the original design. Other accessories include a new power cover with integrated battery, a docking station, and a music kit that replaces the traditional keyboard with something optimized for music playback/remixing. Both Surface 2 and Surface Pro 2 will be available for pre-order starting tomorrow, with devices available on October 22nd.